The Eckhert Place Resort San Antonio Texas offers spacious two bedroom, three bathroom recently constructed condo vacation rentals. Located in northwest San Antonio, Eckhert Place Resort San Antonio’s lodging accommodations are close to the Brooke Army Medical Center and major shopping, and 15 to 20 minutes to everything else, including the airport, Kelly Lackland Air Force Base, and major attractions like Sea World, the Alamo and Riverwalk. Each Eckhert Place Resort San Antonio condo vacation rental sleeps 6 to 8 people in two bedrooms, one with a queen bed and one with two full-sized beds. The living room has a full-sized sleep sofa bed. The three bathrooms include two with showers and one with a tub/shower combo. The condo has tile floors, granite countertops, a full kitchen, and washer and dryer. You may also wish to click here to check availability of our already-reserved weeks. So, go ahead, click here to check our reserved weeks, do the search yourself, or email (or call) us to ask about current inventory. Do whatever it takes to get your week! With its elegant exteriors inspired by traditional Spanish architecture, Eckhert Place Resort San Antonio is San Antonio’s newest landmark for luxury living. 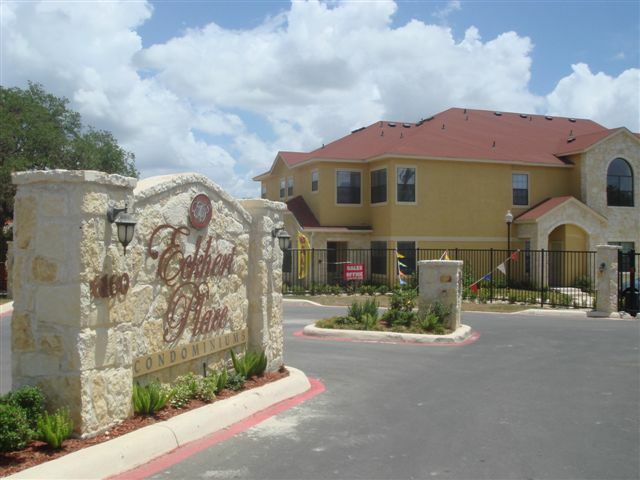 Located in northwest San Antonio adjoining the Medical Center, Eckhert Place Resort San Antonio is ideally situated to provide easy access to the numerous fine restaurants, many retail shops and Six Flags Fiesta Texas Amusement Park. With convenient access to IH-10, and Loop 1604. Eckhert Place Resort San Antonio is within ten minutes of the University of Texas Health Science Center. Close to Sea World, the Alamo, and Riverwalk. If you have any questions or need any help regarding anything on our website, please do not hesitate to contact us. Our email address is [email protected].